Mothers with twins, triplets, and more accumulate a lot of infant and child gear, toys, and clothes. Imagine two or three times the high chairs, Little People playsets, books, pajamas, coats and swimsuits, boots and shoes! That’s why the Minnesota Valley Mothers of Multiples organization hosts two children’s used clothing and equipment sales each year. The crowd-pleasing sales have been Minnesota’s largest sales hosted by a multiples club, boasting over 100 sellers and 20,000-30,000 items available for purchase at each sale. Public shopping is from 10a.m. to 1p.m. and from 1:30p.m. to 3p.m for half price shopping (the sales floor closes from 1p.m. to 1:30p.m. while we reset for half price shopping). MVMOM members begin shopping at 8a.m. Tickets for the public are $2 per person and can be purchased beginning at 9a.m. Shoppers are permitted on the sales floor in the order in which they purchased tickets (i.e. 9a.m. ticket holders will be admitted before 10a.m. ticket holders). Public shoppers do not need to be mothers of twins, triplets, etc. Expecting parents, parents, grandparents, aunts and friends are welcome to shop. MVMOM is a not for profit community organization. All proceeds from the sale go back to support our members–mothers of multiples. Typical sale items include children’s gently used clothing, shoes, cribs, highchairs and booster seats, potty chairs, baby swings, jumpers, saucers, rock and plays, car seats, strollers, bath tubs, baby gates, seasonal outdoor toys like sleds, water tables, books, DVDs, toys, and much more. Half-price shopping begins at 1:30p.m. Many items are marked down by 50%. Can I bring my mother (sister, husband, and/or friend) with me during public shopping? Yes! The sale is open to everyone! Can I bring my kid(s) with me during the public shopping? You may, but we don’t recommend it. The sales floor is bustling with people and merchandise so children can easily get lost in the chaos. Merchandise may not be enjoyed until after it is purchased. Our sale location is home to an indoor playground, as well as a beautiful outdoor park and playground. We encourage you to bring a spouse/grandparent/friend who could watch your kids while you shop! What time do I need to arrive for public shopping? Numbered wristbands go on sale at 9a.m. Public shopping begins at 10:00a.m. Shoppers will enter the sale floor in numerical order. Do expecting moms get to shop first during public shopping? No. All public shoppers are given a numbered wristband and enter the gym in numerical order starting at 10:00a.m. Expecting moms do get priority check out and should come to the front of the line and find a seat. How long does it take to check out? We have been holding these sales for a very long time and with the help of our army of volunteers the checkout process runs incredibly smooth. Wait times will vary depending on the amount of shoppers. At our busiest sale, a few shoppers noted check-out times of only 30 minutes. Expecting moms receive priority check out service and should come to the front of the line to find a chair. Yes, we accept cash, checks or cards bearing a Visa, MasterCard, American Express, Discover, or JCB logo (credit, corporate, debit, prepaid & rewards cards accepted). Use of a card is subject to a 3% processing fee. Will there be any ______ at your sale (specific products)? Unfortunately, we have no way of knowing what our members will bring to sell. Pricing of all items is left up to our member sellers. We recommend that they sell items at 30-40% of the regular retail price. Historically, our average ticket price has been $3. Our sellers have the option of offering their merchandise for 50% off the marked price during the final hour and 30 minutes of our sale. Sale tags are clearly marked to help shoppers spot these discounted items. At the end of public shopping time we close our doors, reset/reorganize our sale floor, and then open the doors again to shoppers, both public and MVMOM members. Items will not be able to be held or reserved in any way while we reset for half-price shopping. What if I get home and notice something is broken or stained? What is your return policy? All sales are final. Our volunteers work hard to make sure the products on our sale floor are of good quality, but we are unable to offer any guarantees or accept any returns. Please check your merchandise thoroughly before you purchase. Who can I ask for help at the sale? We have an army of volunteers who are dedicated to giving you the best shopping experience possible. You will spot them in MVMOM badges and/or MVMOM t-shirts. Please feel free to ask for help. I’m expecting twins! Can I shop with MVMOM members at 8a.m? Congratulations! You must be a MVMOM member to shop before the public, so join today! Email info@mvmom.org for more information. I’m a member of MVMOM; do I need a name tag to enter? When do I start shopping? Can I bring my husband or friend or children with me? Do expecting MoMs shop early? Where can I buy an MVMOM shopping bag? How do I sell at the next sale? Please visit our members-only Member Planet or Facebook groups for answers to all of these questions and more. Click here to add the March 16th, 2019 sale to your calendar and to RSVP. 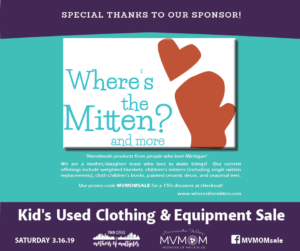 For updates, offers, and reminders about the MVMOM Used Clothing & Equipment Sales, become a fan of our Facebook sale page and follow us on Twitter and Instagram.